Sign up for one of our friendly, creative classes, taught by talented and experienced local artists. To register for any class call: 847.328.4040. The cost for any of these classes is $30 per hour; bring a friend for FREE. Payment is required at the time of scheduling. Call (847) 328-4040 to schedule your class. No refunds, cancellations or changes of date will be accepted unless approved by the instructor. Class samples may be seen in the store. Materials must be purchased prior to the beginning of class. Many classes are held on the lower level of our store. Please let us know if you need accommodations. Instructors: Jan Atherton, Debbie Braun, Kina Denton, Cordelia Herman, Joe Pizzo, Colette Quackenbush, Silvana Tandeter, and Lucie Herman. Click on class name to read description and see photos. Download the Brochure here. 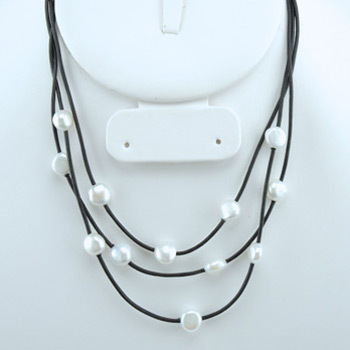 Make this beautiful necklace out of inexpensive beads, a button and leather. So fun! Detailed explanations will be provided upon request. Class is 2 hours long, project will not be finished in class, but detailed explanations will be provided upon request. 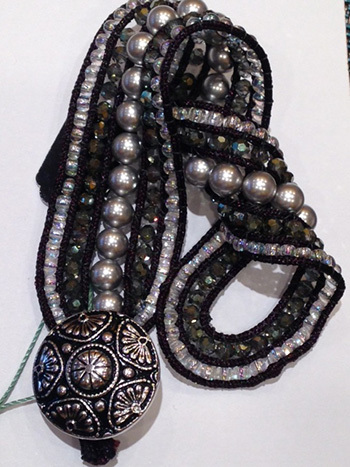 Materials: Superduos, Fireline thread, magnetic clasp, size 6 “o” beads. 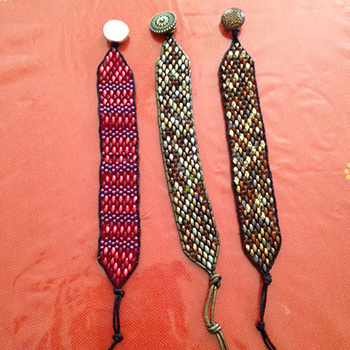 Learn flat peyote stitch bead weaving. Make a simple thin bracelet with your choice of colorful beads. 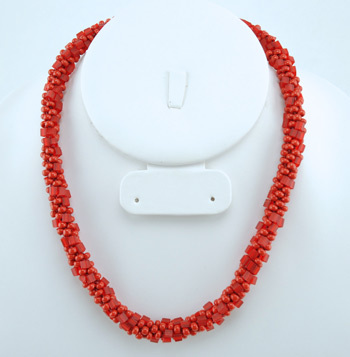 Materials: 1 tube size 11 seed beads, nymo, size 13 needle, clasp. Make a statement that’s bold yet weightless with this style that compliments any persona! Stripes are trending, so why not you? 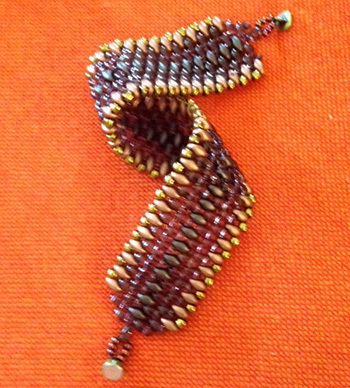 Materials: 1 tube cube beads, 1 tube size 11 seed beads, fireline or nymo, size 13 hard needle, clasp Pre-requisite: basic flat peyote. 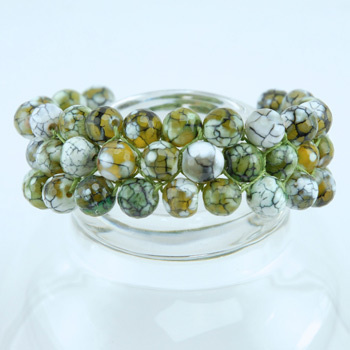 Make this gorgeous bracelet with adjustable closure. Materials: 1 yd leather cord 1mm, shank button, fireline, 1 tube superduo beads. Create your very own unique and beautiful beaded jewelry. You will learn to use one of the most simple and straight forward techniques to create individual works of art. Materials: enough beads to make a 16” necklace, 1 clasp, 2 crimp tubes, 2 feet of Softflex, 2 crimp covers, 2 wire guards. Learn the basic loop-and-wrap technique used to create wire masterpieces. 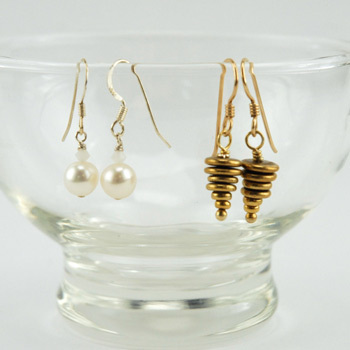 You will leave with a pair of earrings. Learn the knotting technique used by professionals. 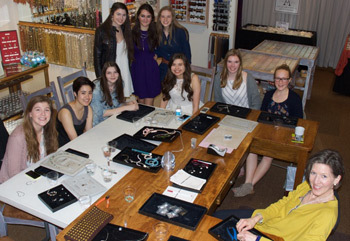 Skills learned in this class can be easily adapted to create illusion style necklaces. In this class, the design should be kept simple to facilitate learning the technique. 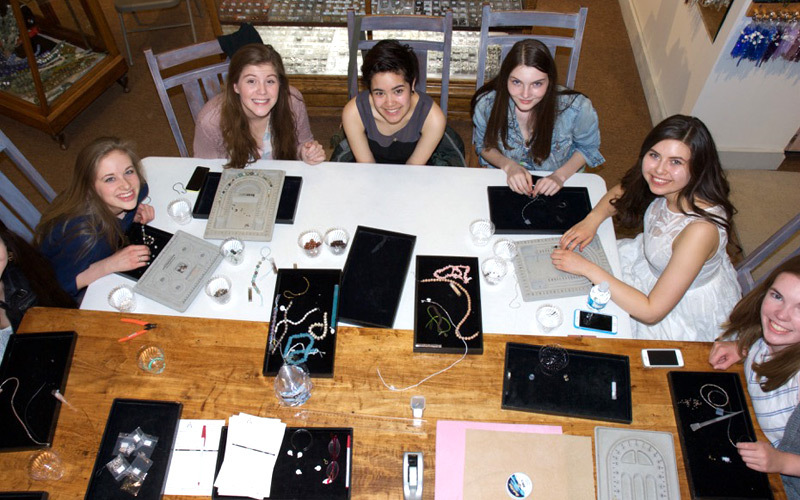 Each student will finish a knotted bracelet. 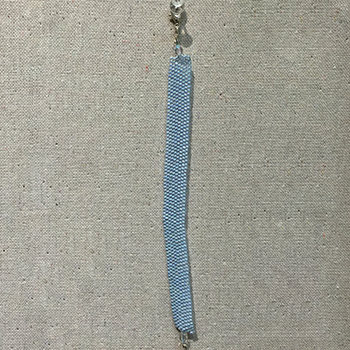 Materials: 1 clasp, French coil, #2 Silk beading thread on card, 8” of 8mm beads. 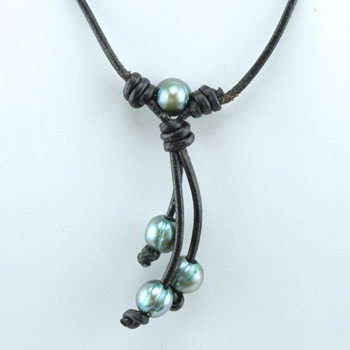 Create your own leather and pearl necklace using a leather wrap knotting technique. You’ve seen the designs in our store, now learn how to make them. You’ve seen this woven leather wrap bracelet everywhere. Don’t pay hundreds of dollars; make your own. This stylish bracelet uses a combination of a crossweaving bead work technique and soft supple leather cording. 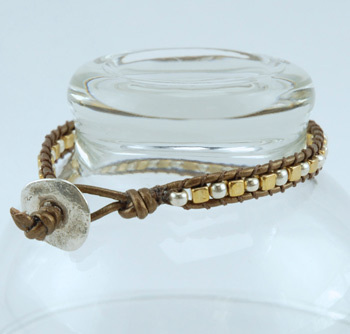 Your single wrap bracelet can be casual or elegant and dramatic. 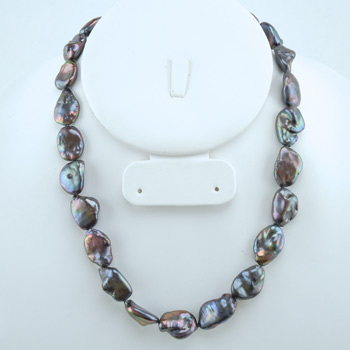 Learn to create a 3 strand floating pearl bracelet, leather wrap closure and knotted earrings. 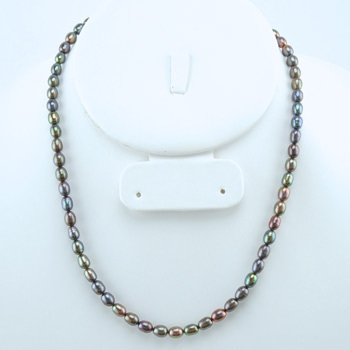 Classy meets organic in this beautiful original design of Freshwater Big Hole pearls, chain, and suede. 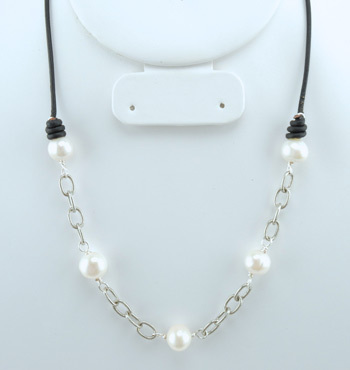 This design combines the leather coil knotting technique, and wire wrapping pearls into chain to create a wonderful flow that allows your pearls to truly dance. Basic knowledge of wire wrapping helpful. Materials: 5 Big-Hole freshwater pearls, 2 yards suede, 20 links of medium to large chain, 1 spool of 20g craft wire, medium to large hook or toggle clasp (must be able to feed 2 strands of suede through the shank), and Super New Glue. Flash an accented wrist with smooth or faceted, subtle or bold, worn alone or mixed with other bracelets. Compliment the adorned wrist you’ve loved on many style pages! 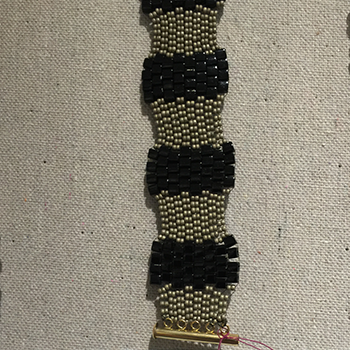 This will be your delight as you complete a woven bracelet cuff (3 strand look) using only 1 strand of beads. Materials: 1 16 inch strand of 8-10mm round beads (hole large enough for 2 strands of S-Lon), 1 large hole bead able to accommodate 6 strands of S-Lon; 1 tube GS Hypo cement, clipboard, S-Lon. Kumihimo (ku-me-he-mo) is a Japanese form of braidmaking. Traditionally done with thread, Kumihimo can take on many forms and is a fun technique to learn. In some cases, it looks a lot like bead crochet. In this class, we will use a braiding disk to make a single color bracelet. Advanced classes available. To register for any class, simply prepay at least 48 hours prior to the scheduled date of the class. No refunds, cancellations or changes of date will be accepted unless approved by the instructor. Class samples may be seen in the store. Materials must be purchased prior to the beginning of class. Call (847) 328-4040 to schedule your class. Many classes are held on the lower level of our store. Please let us know if you need accommodations. 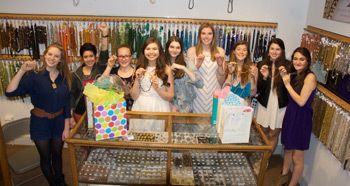 The team at Ayla’s can also host a beading party for you and your friends. You can hold the party at your place or you can bring the party to our store. Whether it’s a birthday celebration or a girl’s night out; come and celebrate with us, walk away with your very own gorgeous jewelry! 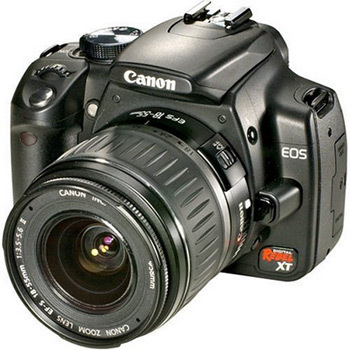 Call (847) 328-4040 for more information.